Mother's Day is right around the corner! 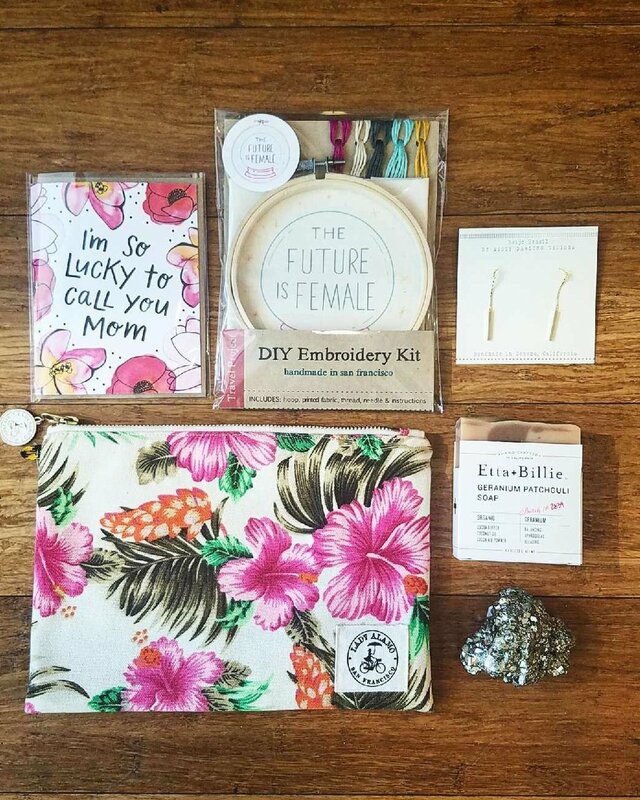 Luckily our shop is stocked with new items from our favorite artisans, and what better gift to give the mom in your life than something made with local love? We put together a little gift guide to make your life simple. Scroll through for some ideas. Stop in for some extra help or shop our online store and use the code "MAMALOVE" for FREE SHIPPING (Domestic within the US) now through May 13th. Let's Put a Bird on It makes beautiful candles that any mom would love. Their hand crafted scents are smooth and rich. What a nice little pick-me-up! And bonus, a portion of the profits benefit animal rescue! 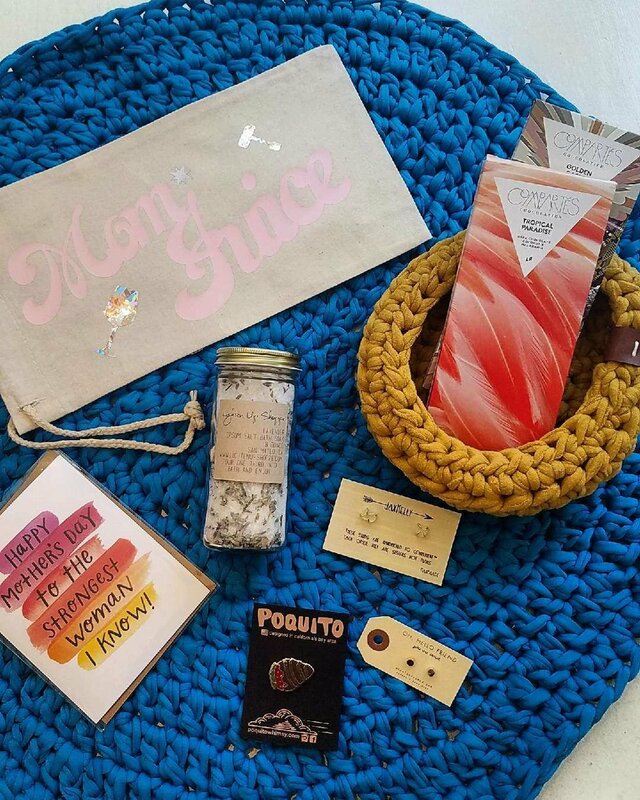 We love using these local San Francisco bags as gift-bag builders - they are the perfect size to fit a few items for a beautiful Mother's Day collection when you can't choose just one! Does mom have a green thumb? We're stocked with Hemleva's 'Plant Lover' and 'Monstera' leaf gold-back pins (and special 'plant killer' pins for the black thumbs too)! Giving the gift of wine is, let's face it, always a winner. We have a limited stock of our 'Mom Juice' and 'Therapy' wine bags to go with your perfect Pinot. For the effortlessly chic mom, Baleen is one our favorites. We've brought in their newest collection of long pendants, bangles, earrings, and chokers. We're also hosting a Natural Perfume Workshop on Mother's Day! Bring your mom in and create your own custom scents with us on Sunday May 13th at 11a. Only a few spots left! What a fun mother/daughter experience! Take her on a date to tomorrow night's Floral Arranging Workshop. Get $5 off by using the code "FLOWERPOWER" today only! Spoil her with our favorite Chevron Ikat Kimono (one size fits most so no need to guess her size!) or a new date night dress. Pamper her with our locally made Inner Peace Balm and soothing Slumber Serum. Gift her a sweet necklace she'll never want to take off. Visit us in the shop for more ideas! Happy Mother's Day! gather's 3 Year Anniversary Celebratory Weekend! We can't believe it's been three years since we opened our doors at gather! We are so lucky we get to do what we do everyday. Featuring local and indie artists in our shop makes us so happy and we couldn't do it with out our amazing customers. We will be having a big weekend of celebration Saturday May 6th and Sunday May 7th to say thank you. Check out the details below, we hope to see you all there! Special guest Elizabeth Street Cosmetics will join us as for a special lip bar. We're so excited that a small selection of their lipsticks will now be available in shop and are kicking it off with this fun event. Have your lips professionally done and leave with a customized chart to take home. La Bodega Flora will also be rolling her cart up to gather for a special pop up full of their gorgeous hand-tied bouquets and planted goodies. You can even pre-order your flowers for Mother's Day and pick them up at the shop the following weekend! 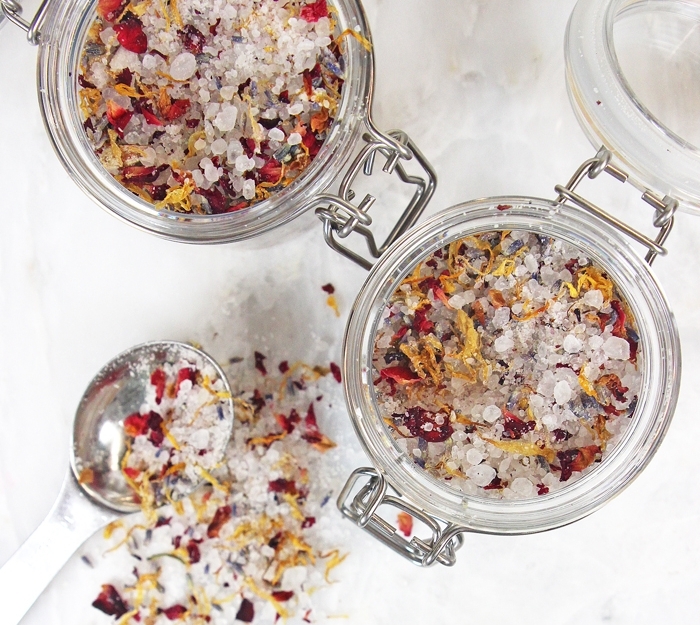 Buy any lip product and flower or plant and you will receive a free jar of handmade bath salts soak. Perfect to gift for Mother's Day or keep for yourself. And to make it extra festive, we will be celebrating with mimosas! Our favorite market of the season is back in our neighborhood! Join us as Urban Air sets up in Hayes Valley. With many of our artists setting up booths it's a great opportunity to meet some of our amazing makers. La Bodega Flora will be popping up again with her traveling floral and plant cart from 1-5p. Grab some beautiful flowers for the apartment. We will be serving mimosas all day and be giving away a gift bag full of goodies from the store. Every customer who makes a purchase will be entered in the raffle. Also we will end the weekend with a big sale. Spend $100+ and get 10% off your purchase and spend $200+ and get 20% off your purchase. Our gift to you! We welcomed Jessica Hannah of JHannah Co again last night for our popular Natural Perfume Workshop. We love offering this class because it is such a unique experience and Jessica is truly an extraordinary instructor. What fun to create your very own custom perfume! Missed out on the fun? Sign up for our May session now before it sells out! Would make a lovely Mother's Day gift or date night! With Mother's Day fast approaching (this Sunday!) we've decided to put together a little gift guide to give you a few ideas that your mama will love! A dainty necklace from Nikki Montoya that she'll never want to take off. Don't forget the card! We've got new ones from Live Love Studio where each purchase provides one meal to a hungry tummy in East Tennessee. Temporary gold tattoos from Oh Hello Friend because they are o so much fun. A spot in our Perfume Workshop on Thursday May 19th. She'll learn all about the history of perfume and leave with a bottle of her own custom scent. A linen dress from Bridge and Burn for Summer. Ceramic Amulet to always keep her safe. A fun color of nail polish from Floss Gloss. We've got lots more in the shop so stop by and let us help you put together the ultimate gift!